The Chinese New Year, Lunar New Year or the Chinese Spring Festival commences from today. It brings forth the year of the majestic goat, promising prosperity and hope. It is the beautiful time of the year, when traditional customs are followed and lots of Tea related ceremonies are practised. Homes are purified and decorated with charms to invite fortune, gifts are exchanged, Tea ceremonies are carried out and evenings are welcomed with fireworks and lots of delicacies. It is a common practise to pay respect at the temples or shrines, which also sometimes hold festivals and dance performances. Tea has been a great inspiration and my motivation for learning and appreciating the Chinese heritage, where it is respected as an elixir for spiritual consciousness. In China, the diversity of practises and rituals in context to Tea, performed during the new year festivities, varies from regions based on their own heritage and custom. A popular practise is of brewing the traditional Pu-erh (one of my favorite tea), Ti Kuan Yin Oolong or Black Tea, which is served to the eldest member of the family and on to the youngest. Choosing a fine variety of Tea is essential to the ritual. Prayers and blessings are passed down from the elders of the family to the youngest, with every cup of tea served. “The Tray of Togetherness”, also called the box of prosperity is served with Tea. This is a wonderful treat of assorted sweets and is customarily shared with family and friends present at the ceremony, to bring the sweetness in one`s life. If one travels to Southern China, the ritual is conducted by offering three cups of tea. Each cup of tea holds a meaning in this ceremony. The first cup is a ‘Sweet Tea’, for sweetness in life during the year, brewed with crust glutinous rice and sugar. The second cup is a ‘Smoked Bean Tea’, which brings harmony. It is a blend of tea leaves, smoked green beans, shredded carrot, orange peels, perilla seeds and sesame seeds. The last cup of Green Tea is offered after a meal and this concludes the Tea ceremony. The ceremonies are not simply customary traditions but also provide a sense of togetherness and veneration, of the rich heritage of the Chinese. The Lantern festival draws the fifteen days of this grand Lunar new year festivities to an end, with sea of vibrant colorful lanterns, with messages or prayers of love, fortune and happiness for the heavens above. It is truly said, when a cup of tea is revered, brewed and shared with people, with lots of love, a huge ounce of hope and with a dollop of promises, it brings a sense of happiness and prosperity. 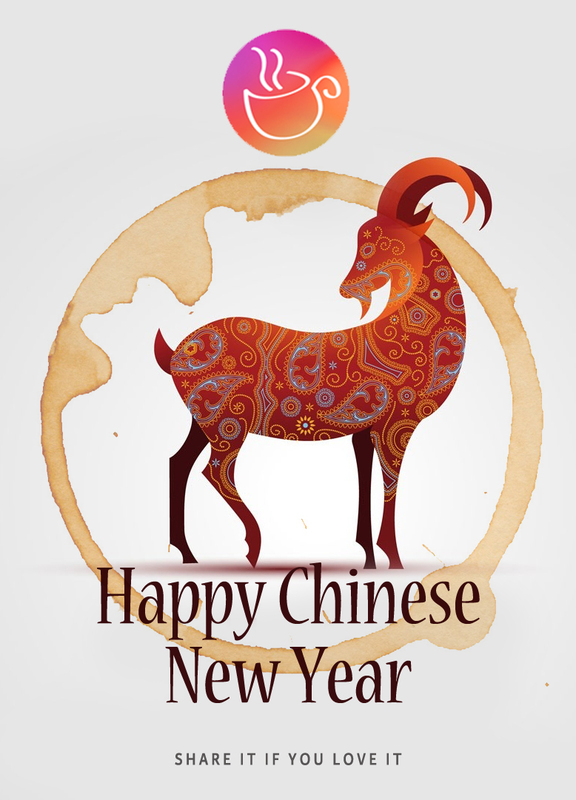 I conclude my blog with wishing you all a very Happy Lunar New Year and may every cup of Tea bring you bliss and fortune. This entry was posted in Tea Ceremonies, Tea Traditions and tagged China, Chinese Goat Year, Chinese New Year, Chinese New Year Tea Ceremony, Chinese Tea Tradition, New Year, tea, tea blog, Tea Traditions. Bookmark the permalink.